The rule of thirds in photography is likely the most commonly used rule of composition and it's one of the easiest techniques you can use to improve your photography. It's a good rule rule to use in many situations, but not all. You can use this article as a rule of thirds tutorial to teach yourself how and when to use this useful rule of composition. Some of these examples of the rule of thirds in this post will show you subtle uses of the rule and other examples will give you more obvious situations for you to use it. Pour your favorite beverage, relax, and take a few minutes to dive in. Rather than just scroll through the article, take a little time to really study the images and their compositions. You'll get a deeper understanding of the rule of thirds and be able to use it more appropriately and more effectively. 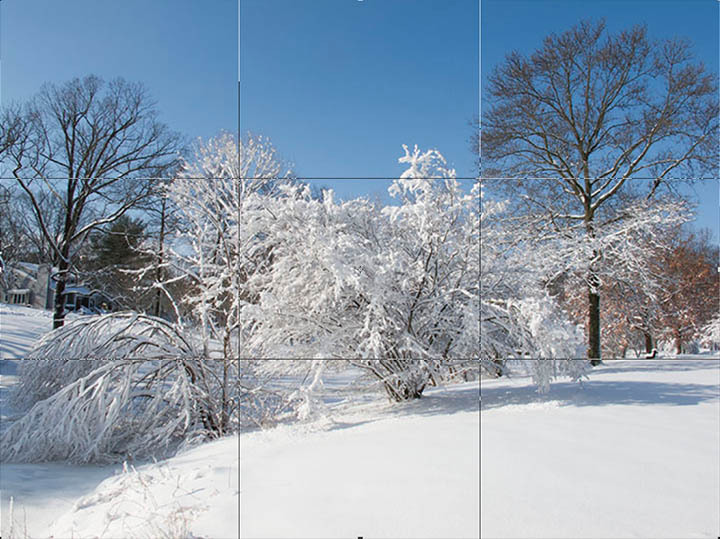 In the "After The Snowstorm" photo, I composed the photo by visualizing imaginary lines, both vertically and horizontally that divide the photo up equally into 3 sections. I aligned the top of the snow area and the bottom of the blue sky area approximately on the two horizontal lines. However, I did NOT place a center of interest object at any of the intersections of those 1/3 lines which is the standard way most instructors describe it. The result is a nicely balanced photo. You'll see more obvious standard examples of using the rule in a second, but first let's check out the how to use it. Simply imagine dividing your view into thirds (both horizontally and vertically) with lines. You'll have an imaginary 9-part grid overlaid on top of your image as a guide. 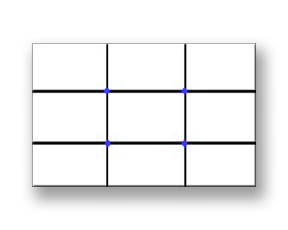 Those imaginary lines also intersect at 4 points in your field of view. 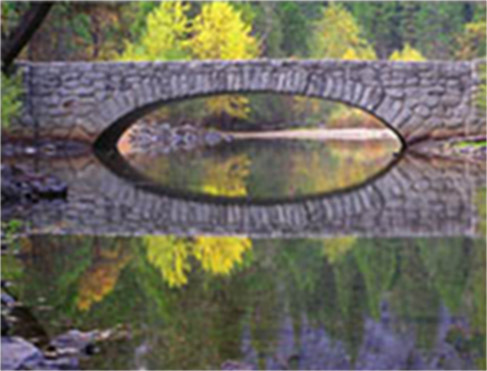 You do this when you are holding your camera horizontally (like the fisherman photo below) or if you are shooting vertically, up and down orientation (sometimes called "portrait" orientation). 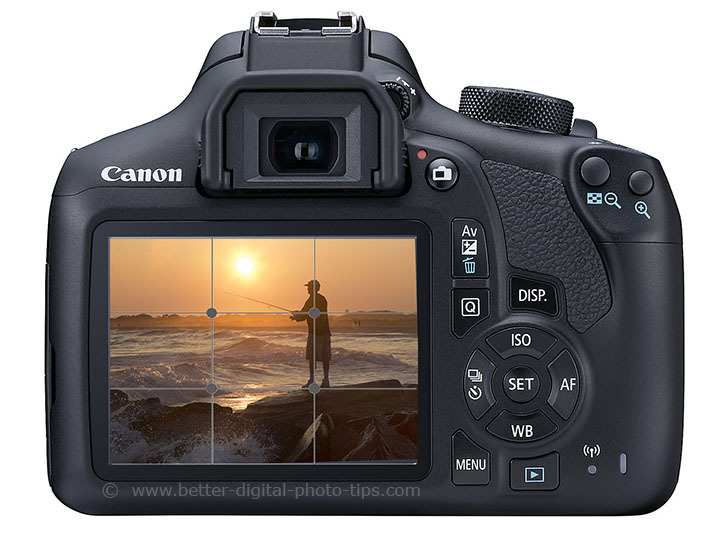 Some digital cameras have a setting where you can have those rule of thirds lines show up in your viewfinder or on your LCD screen to help you when you are composing your photo. Move your camera position and adjust your lens zoom setting until you have the important parts of your photo along one of those lines and/or one of the 4 intersecting points. Take a few subtle variations while your shooting and evaluate them later on the larger screen of your computer. Place the horizon at one of the imaginary 1/3 lines. These photos show you an interesting subject and how you can change the emphasis with your composition. The first photo shows you the common mistake of dividing your photo in half. The second photo is better by placing the horizon at a 1/3 spot. The third photo is altogether different by changing the horizon to be placed at the top third. The middle photo emphasizes the sky and the photo on the right emphasizes the waves. Okay, You see it's an easy rule to understand, but there are obvious, as well as more subtle situations on when to use the rule of thirds in photography. Landscape photography often includes horizons and as a general rule of thumb you should not take the photo with the horizon dividing the frame into two equal parts. Use one of the 1/3 lines instead. You can see how the horizon was placed almost exactly on the line 1/3 of the way down from the top. If you follow the shoreline with your eye you will see an "s" curve and that is another composition technique that can work well with the rule of thirds to give you a winning composition. The photo on the left shows what is usually a common photography mistake, The Bulls-Eye Technique. 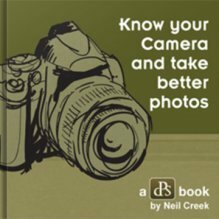 That is placing your focal point, your center of interest, directly in the middle of you photograph. See the tower in middle of the photograph? In this case, it's not such a big deal. The tall tower is fairly small in the photo and both the globe on the left and the tree on the right act like large framing devices. 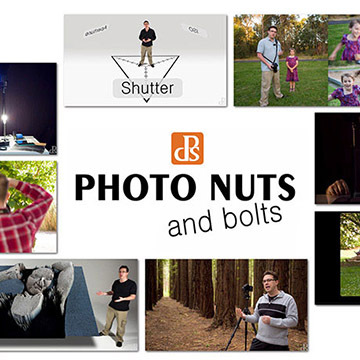 The photo on the right used the rule of thirds in a subtle way. I zoomed in a bit and I aimed my camera just a little more to the left. This moved the two towers to about a one-third the distance from the right edge of my photo. Okay, Bruce, what's the big deal here? This isn't a huge difference in this example. I agree. It this instance it is a subtle difference. Sometimes it makes a BIG difference in your photo. It is an small improvement though, and sometimes those small differences make a good photo into a great photo. Next, is another example below, of an improvement in composition by using this rule of thirds again in a subtle way. The original is on the left. The improved photo is on the right. Here is a very short video below of the same technique used to improve your photography. The rule can be used when shooting video with your camera as well. It is a bit more difficult when you have a moving target as many video clips do.The standard thing many photographers do is to simple aim the camera directly at the main subject. If the photographer had zoomed in even closer, I think it would have improved the composition even more. 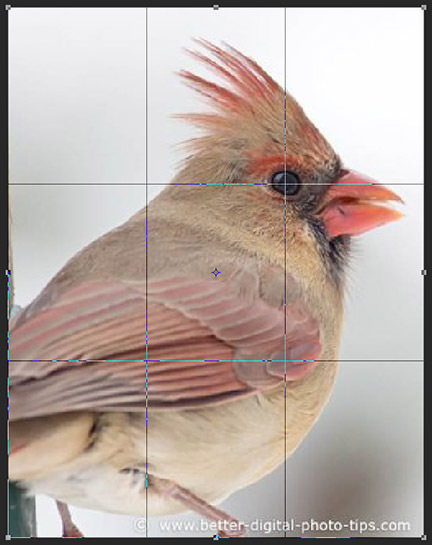 The photo below shows how to use the rule of thirds when shooting a close-up of a bird. It wasn't one of my favorite photos, but you can see that placing the bird's eye at one of the intersections of the 1/3 lines created a pleasing, balanced composition. Here's the 3-step formula to figure if you should use this technique or not with your photography. Use the rule of dividing into thirds to compose your photograph. Compose another photo of the same subject, but this time without using the rule. Compare the two and see which one you like. Of course, the saying goes that all rules are meant to be broken. Or is it, all records are meant to be broken? In any case with compositions rules, they should only be used as good guidelines that will help you compose better photographs in most situations. 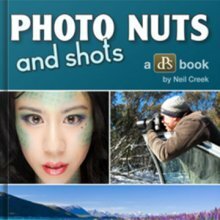 There are, or course, situations where you will want to break the rule of thirds, and you can always crop your photograph afterwards. It's just a guideline for balancing elements in your photography. This composition rule has been used in painting, art and design for a long time, perhaps since the time of the art created by the caveman. It says you should divide your viewfinder into nine equal parts by two equally spaced horizontal lines and two equally spaced vertical lines. You are dividing the picture in thirds, side to side, and top to bottom. Those imaginary lines intersect at 4 points in your field of view. 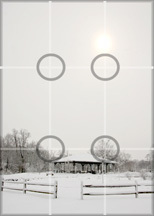 As you look through your camera viewfinder or at the screen on the back of your camera or camera phone, points of interest in your photograph should be placed at or close to the intersection of the lines, shown by the circles in the illustration. This gives the photo more energy and interest. The Rule of Thirds in Photography can be used almost instantly to improve a photograph. Good use of other composition rules such as balance, leading lines and perspective are often more involved. With the inclusion of zoom lenses on almost all digital cameras, it's a simple matter to zoom in or to zoom out, to recompose your photo and employ the rule of thirds at least to some extent when it "feels" right. 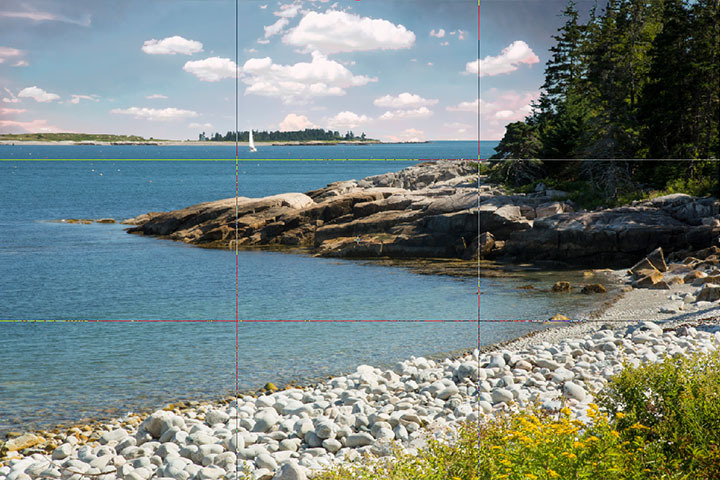 The recap of what is the photography rule of thirds: it's a way to divide your image into imaginary sections by superimposing vertical and horizontal line across your camera frame at 1/3 distances. Even with cell phone cameras to some extent, you can adjust your composition by changing the the magnification and combine that with a slight change in your cameras direction to achieve a better photo. Photography composition rules are subjective and should not be followed religiously. The best part of digital photo editing is that you can try a few slight variations when composing and choose your favorite afterwards.